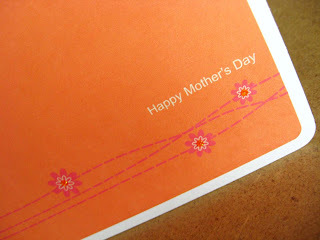 Schlosser Designs: Customizable Mother's Day Cards Anyone? Customizable Mother's Day Cards Anyone? Thank you so much to all my testers! I made a few changes based on the feedback I got from you and here's the final product! Download the PDF here. There are two cards on the sheet. Just print on 1 sheet of white cardstock, cut in half, embellish, and you're done! But wait, you might ask why I had some testers test this project out first. It's because the sentiment on the front of the card can be whatever YOU want it to be! (Look for more projects with this feature shortly!) When the PDF opens up, click on the sentiment where it says Type Custom Sentiment Here and type away to your hearts content. These cards will allow you two lines in which to type a custom sentiment for your mom! How awesome is that? Edited: Thanks Daniel for letting me know about the bandwidth! It is a pretty popular download. The location has now been moved and is ready for downloading again. I'm working on moving the rest of my projects over so as soon as they are moved I'll let everyone know. Thanks for your understanding! WOW! AWESOME Erin! I have often wondered if things could be saved like that! Thanks for another wonderful project! wow, how do you get a field like that into a pdf? You're WONDERFUL! Thanks so much for generously sharing this! I'll be linking. Thanks so much, this is a lovely design and I love the customizability. hey i really like this! please do more like this!! thnx!!! Thanks Daniel for letting me know! The problem has been fixed for now! This is genius! I just used it for a custom wedding card. Are you going to offer one for Father's Day? If you did, you'd be my hero! Just wanted to let you know I featured your awesome Mothers Day freebie. I love the colours and simplicity of it!